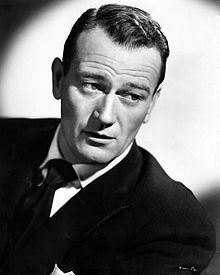 Marion Mitchell Morrison (born Marion Robert Morrison; Mey 26, 1907 – Juin 11, 1979), kent professionally as John Wayne an nicknamed Duke, wis an American actor, director, an producer. An Academy Awaird-winner for True Grit (1969), Wayne was among the top box office draws for three decades. ↑ Kehr, Dave. "John Wayne News". The New York Times. Retrieved July 30, 2011. ↑ "John Wayne". The Numbers. Retrieved March 29, 2012. ↑ "Quigley's Annual List of Box-Office Champions, 1932–1970". Reel Classics. Retrieved March 25, 2012. This page wis last eeditit on 15 Dizember 2018, at 00:29.